Call it what you will, stuffing or dressing, but it cannot be Thanksgiving without it. 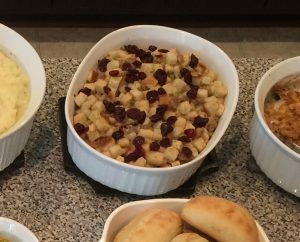 Technically, stuffing comes from actually stuffing the bird with the bread mixture and it cooks that way, whereas dressing is a bread mixture cooked outside of the bird, usually in a pan or baking dish. With that being said, I cook this “stuffing” in the oven, not inside a turkey. Now that we’ve had our Thanksgiving lesson for the day, what’s most important is the taste, and this stuffing is yummy! Now onto the stuffing itself. 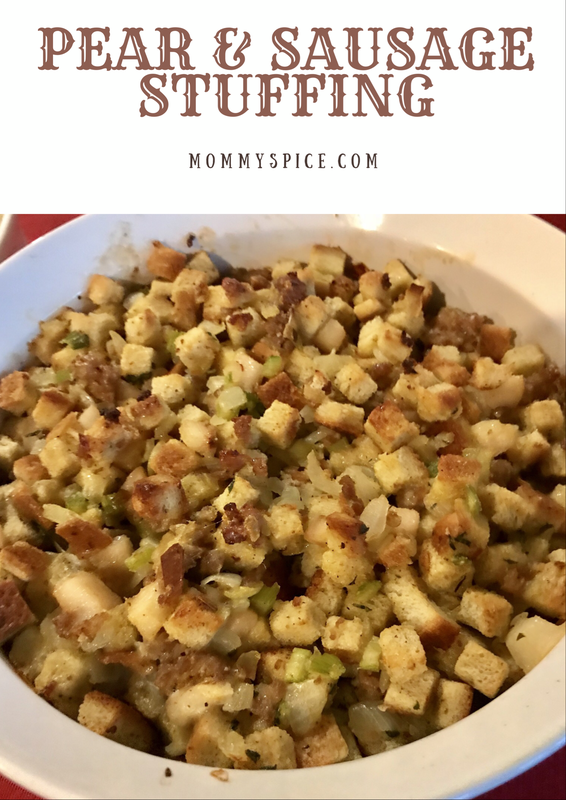 I’ve done the whole making your own bread cubes, toasting them or letting them stale, however, the Pepperidge farm stuffing mix bag is a short cut I use and love. You can really dress up the bag/box stuffing and no one can tell the difference. The “dressing up” I am talking about is usually the addition of a protein, a fruit and a texture added to the usual butter, stock and veggies the packages advise. Two favorite combinations I’ve used are sweet Italian sausage, pear and craisin or spicy Italian sausage, Granny Smith Apple and walnut. Preheat your oven to 350 degrees. Heat up butter in a large sauce pan, add onion and celery and cook until tender and onions are translucent, 5-7 minutes should do it. Pour in your broth and bring to a low boil. Take mixture off of the heat and stir in the bag of stuffing mix. While your onion and celery are cooking, brown and break up your sausage in another pan over medium high heat. Add cooked sausage to prepared stuffing and mix until combined, then pour into a large baking dish. Next stir in your pear, and cover. Bake 30 minutes, then uncover and bake an additional 5 minutes. Finish by topping your stuffing with craisins and fresh sage. If you’re interested in the other version of this stuffing, sub out the pear for apple, sweet sausage for spicy and craisins for walnuts. The measurements will stay the same. My tip for this one is to prepare it ahead of time if you can, the stuffing mixture will stay good for a day in the fridge. Plus less to prep Thanksgiving day morning is a win in my book. If preparing ahead of time, the cooking time will need to be adjusted. I usually start with adding 15 minutes, for a total of 45 minutes at 350 degrees and add more time if needed.